Long before wall-building became a showpiece election promise in the U.S., fences went up on Europe’s southern border to keep migrants out. Long before wall-building became a showpiece election promise in the U.S., fences went up on Europe's southern border to keep migrants out. That effectively turned Melilla, a tiny Spanish enclave on the north coast of Africa, into a gated community. The fence is monitored 24/7 with infrared cameras, motion sensors and watchtowers that make it possible to respond to a breach within a minute. Moroccan authorities, supported by EU money, also help keep migrants away. But 20 years and millions of euros later, that fence has yet to dissuade migrants from coming, or to remove Melilla from the modern-day map of possible back doors into Europe. As the migrants' sea route to Europe shifted from Italy to Spain this year, Melilla and Ceuta — another autonomous Spanish city on the Moroccan coast — have seen an increase in the number of asylum seekers and migrants arriving within their borders, too. There is also real concern those numbers will grow. The tiny port of Melilla has long been a coveted gateway to Europe, and its fence, built in 1998, predates Donald Trump's recent suggestion that Spain build a wall across the Sahara. But now, there are Syrians and increasingly Yemenis among those looking for a way in. They join the continuing inflow of North and sub-Saharan African migrants. They get around the fences by paying smugglers to put them on rafts or sneak them through official border crossings, often stashed in the nooks and crannies of ordinary vehicles. "We have seen cases [of people] in the most unbelievable places — like dashboards, inside the spare tire, under the seats, even inside the fuel tank," said Jose Luis Roman, who speaks for Spain's Guardia Civil, which is responsible for monitoring the border. There are also migrants who manage to jump over what is now a six-metre-high triple fence aimed at containing Europe and keeping Africa out. "There is no other way," said Osama, a 20-year old Yemeni who arrived from Sana'a, and said he succeeded on his second attempt to enter Melilla. "I was told the easiest way was over the fence." Osama isn't alone. More than 4,700 in Ceuta and Melilla have jumped the fence from Morocco so far this year, most of them arriving in Melilla. In both enclaves, but more recently in Ceuta, there have been mass jumps, believed to have been co-ordinated by smugglers. In Melilla, 130 from sub-Saharan Africa jumped over in January. "The images of immigrants climbing the fence trying to get to Europe — that is the symbol of Melilla," said Dunia Mansouri, an opposition representative in the Melilla assembly. "I think it's a disgrace." 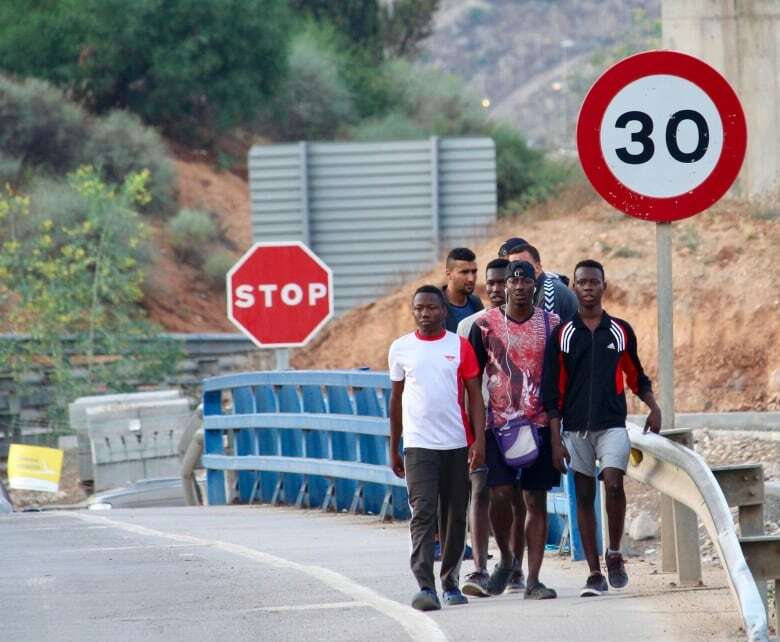 Along with the dramatic increase in the number of migrants reaching mainland Spain — nearly 39,000 so far this year — those images in Ceuta and Melilla set off panic in some European capitals, where many people are loath to see more migrants arriving on European soil. The growing migratory pressure on Spain underlines the expectation that Melilla and Ceuta would continue to have Europe's back and slow the steady movement toward the continent. 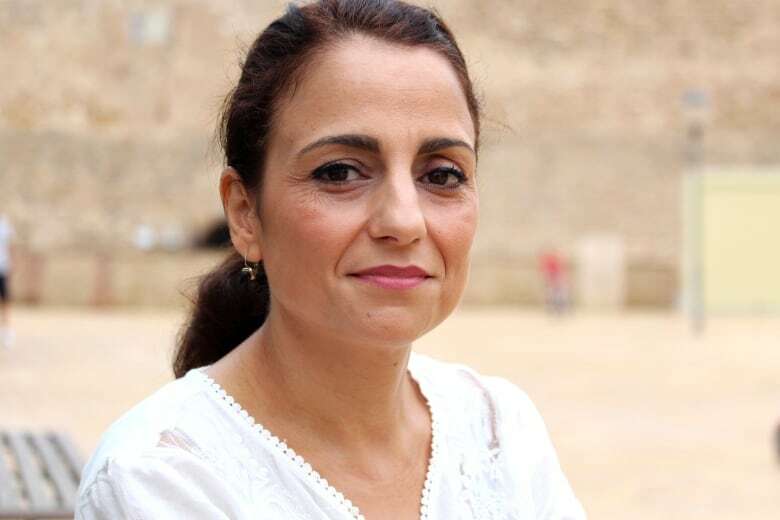 "It's definitely a complicated task," said Sabrina Moh Abdelkader, Madrid's representative in Melilla. "Because we are the southern border in Europe, we have a very important job to do." "This is a big responsibility," she said, "to be the entrance to Europe." That responsibility is made slightly easier because of where Melilla sits – nearly 200 kilometres across the Mediterranean from the Spanish peninsula, and an even longer journey to France or Germany, where some asylum seekers have connections or family. That means migrants who arrive here haven't quite made it to the Europe of their dreams. They have at least one last and significant hurdle to clear, likely involving a six-hour ferry ride. It also means that to truly have Europe's back, Spanish authorities must patrol the port for stowaways and control who gets deeper into a continent that has grown increasingly hostile to migrants. Migration has long been part of Melilla's story — you can see it on the streets, and in the names of officials such as Mansouri, whose father immigrated to Spain. Many would-be immigrants languish in Melilla waiting for resolution to their cases, and like the fence, they have become part of the scenery. The main temporary shelter is at many times its capacity of 300 to 400. Unless they are from Syria, people here might wait months, even years before a stretched system lets them know whether they have successfully claimed asylum. There are thefts and occasionally fights inside the shelter. It is so uncomfortable that men often sleep outside, sometimes in the rain. During the day, they build fires and cook outside the premises, making seats and day beds out of grimy sheets of cardboard just a fence away from a well-groomed golf course. It's still better than conditions at home, said Alusine Diallo, who left Guinea and crossed Mali en route to Europe. He was smuggled on a raft intended for Spain's southern coast — only to inadvertently arrive in Melilla. 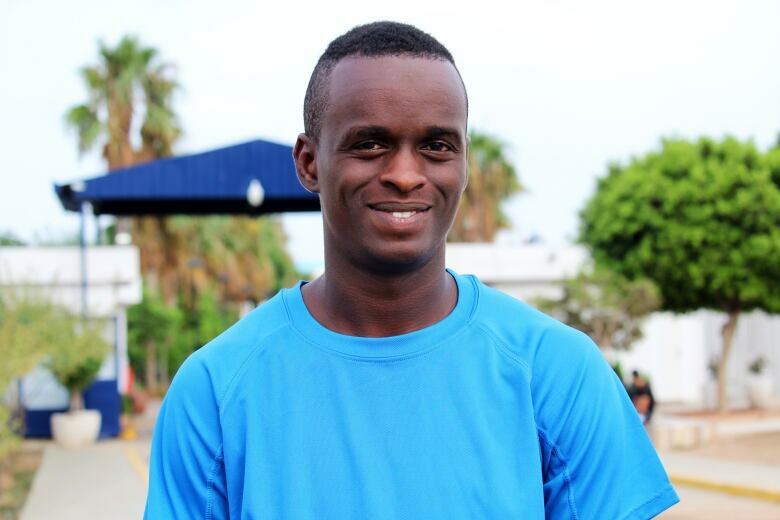 "Considering certain factors, you might have to take some risks sometimes," said Diallo, adding that life in Guinea is "very difficult." "No education, no jobs, no technical abilities." As the eldest son, he was expected to seek out employment and help support the family. But in Melilla, which already has a 30 per cent unemployment rate, there's little to do but wait. That leaves many here unmotivated, because their focus is just getting to Europe, said Professor Jose Luis Villena, who works with asylum seekers outside the shelter. 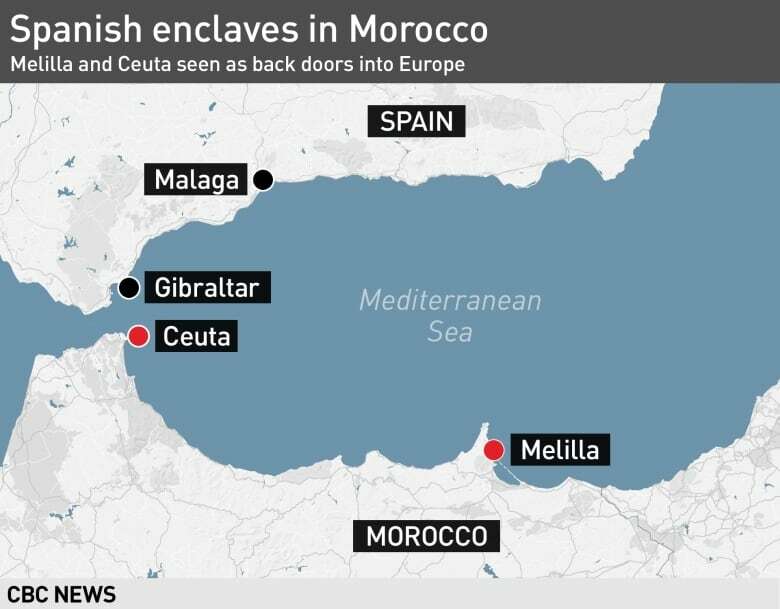 All they want to do is escape "this open jail that is Melilla." While the fences in Melilla and Ceuta succeeded in bringing the numbers of migrants down over the years, they haven't stopped the problem of irregular migration entirely, creating new challenges in the process. For many here, it's hard to imagine Melilla without it. 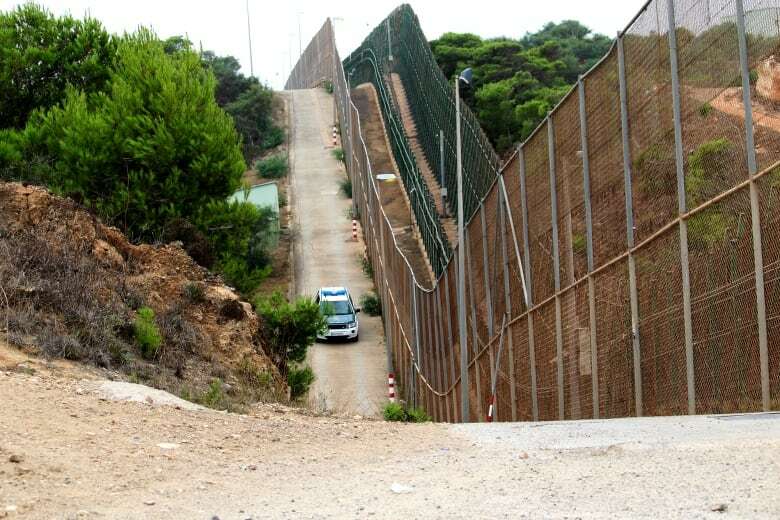 "Without the fence, the pressure would be huge, and Melilla doesn't have the resources to sustain so many people that want to head to Europe," said Roman from the Guardia Civil. Mansouri said migration in Melilla has become an industry. Even the travelling fair that comes every September plays a role. Every year, the end of the fair brings out kids looking for a special ride. In the dark, unaccompanied minors who have come from nearby countries — and many of whom live on the streets here — stalk the dismantled Ferris wheel and bumper cars hoping to stow away in the trucks that carry this equipment on a ferry back to the Spanish Peninsula. The migrants call it "making risky." 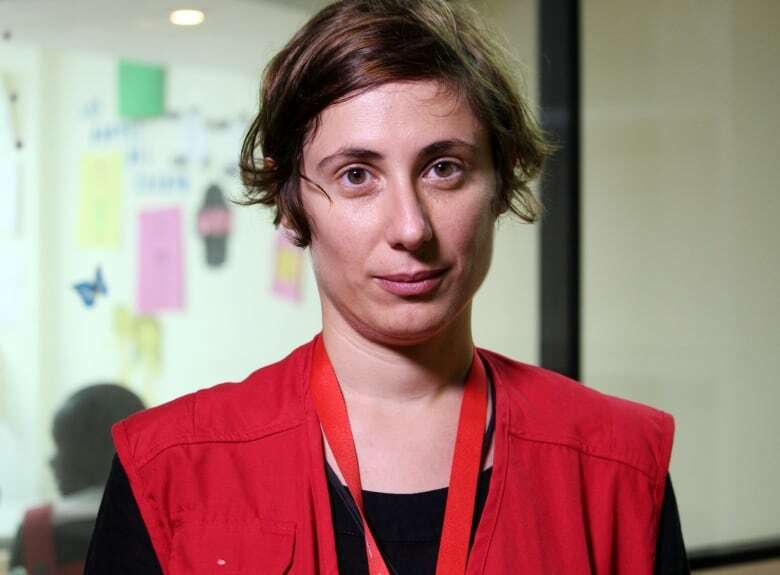 "'Risky' is something like a dream," says Giulia Sensini, responsible for Save the Children's Melilla program. It can mean hours, sometimes days without food or drink as they wait to be spirited to the other side. "It's very dangerous," she said. Some of the exasperated fair workers carry long wooden sticks to scare the kids away. The police occasionally show up and chase the teenagers down the street. But they return, and settle in for the ride — sometimes even on the trucks' roofs. By sunrise, the trucks make their way to Melilla's port. And every time, national police and Spain's civil guard are waiting for them, using sniffer dogs and heartbeat monitors to ferret out the migrants in what is dubbed "Operacion Feriante." Under the gaze of journalists, including CBC, the officers push, cajole and drag the teens out, leading them one by one to a police van. With the exception of the odd small backpack, they have little with them beyond what they're wearing: often a hoodie and flip-flops. 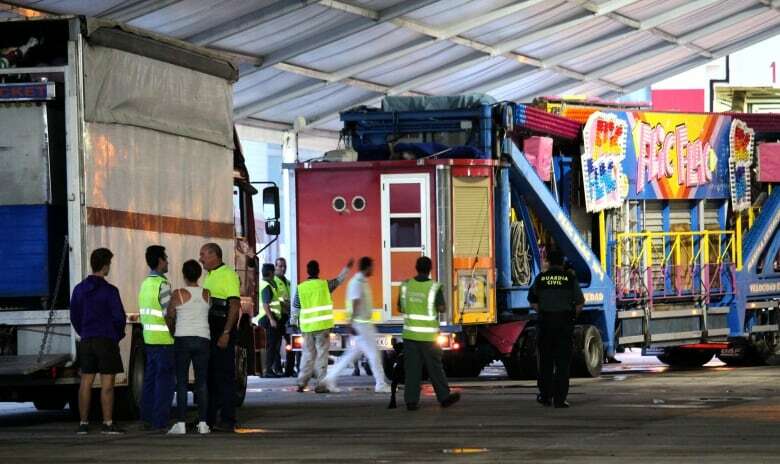 In the two days after the travelling fair packed up, police stopped 69 stowaways, 38 of them children. Some of them end up back on the streets of Melilla – sometimes sniffing glue or on drugs. You can see them at the port daily, waiting for the next opportunity. Yet some of them eventually make it to mainland Spain and points beyond, riding aspirations even walls can't contain.